In Manhattan’s diverse neighborhood of Harlem, the incidence of HIV/AIDS is staggering. With limited access to quality care, education and treatment, the rate of infection is five times the national average and HIV-positive people in Harlem are 50 percent more likely to die than in Manhattan as a whole. Feeling alone and hopeless, Fayetta reached out to Harlem United Community AIDS Center, one of the 462 AIDS and family service organizations nationwide that received a grant in 2016 from Broadway Cares/Equity Fights AIDS. Broadway Cares awarded a record-breaking $6.6 million this year to AIDS and family service organizations in all 50 states, Puerto Rico and Washington, DC. These grants give hope, opportunity and empowerment to those in need across the country. Although people are living longer thanks to advancements in medication and awareness, HIV transmission rates remain the same today as they did in the 1990s. Of the 1.1 million people living with HIV/AIDS, 76 percent are men. After moving to Coeur d’Alene, ID, Valentine sought help from the North Idaho AIDS Coalition. Once he was given the correct medication to regain his strength and the mentorship to fuel his self worth, he was able to rekindle his love of music. He now channels his emotional journey into his songwriting. North Idaho AIDS Coalition’s 2016 grant of $10,000 was part of the summer’s largest grant round, which awarded more than $2.2 million to 299 organizations. The funding supports direct services and case management, supportive housing programs, emergency financial assistance, harm reduction programs and quality of life services. Earlier this year, Broadway Cares awarded $1.8 million to 118 organizations for food service and meal delivery programs. Helping ensure nutritious meals reach those in need remains a high priority for Broadway Cares as it is an essential part of a lifesaving regimen. In March, $842,000 was awarded to 45 nationally recognized AIDS service and advocacy agencies. The work of these agencies directly impacts the hundreds of service providers Broadway Cares funds. With support and encouragement from the AIDS and family service organizations Broadway Cares awards grants to, the most vulnerable among us are given a newfound sense of hope and purpose. 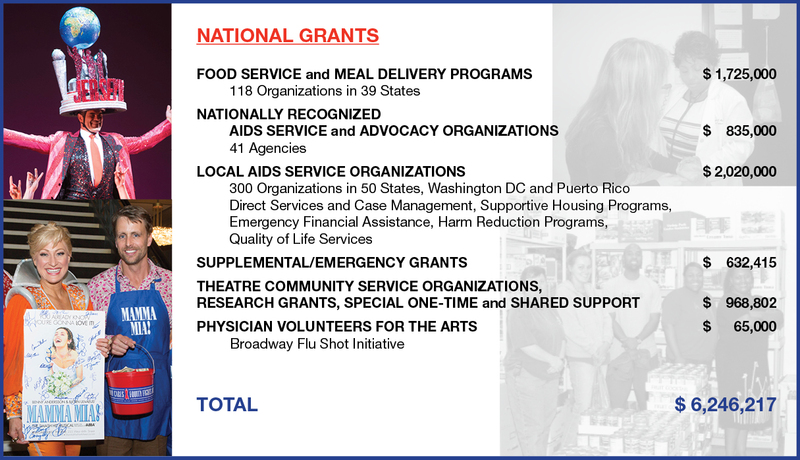 Broadway Cares/Equity Fights AIDS will extend invitations to apply for the three rounds of our National Grants Programs in 2017 only to those organizations that were awarded grants previously. At this time we are unable to extend invitations to apply to any organizations that have not received grants from Broadway Cares in the past. Organizations that received a grant in 2016 will automatically be sent the application materials when they become available. Any organization that received a grant in the past but not in 2016 must request an application by contacting Brian O’Donnell at odonnell@broadwaycares.org or 212.840.0770, ext. 226. Applications for this grant round will be mailed out to previous grantees in mid-November 2016. The deadline will be December 18, 2016. The grants committee will meet to review proposals in January 2017 and awards will be announced in February 2017. Applications for this grant round will be mailed out to previous grantees in February 2017. The deadline will be March 17, 2017. The grants committee will meet to review proposals in March 2017 and awards will be announced in April 2017. Applications for this grant round will be mailed out to previous grantees in April 2017. The deadline will be May 26, 2017. The grants committee will meet to review proposals in June 2017 and awards will be announced by August 2017, with all award checks sent before September 2017. Broadway Cares/Equity Fights AIDS is one of the nation’s largest HIV/AIDS-related grant-making foundations, granting more than $10 million annually and more than $155 million dollars since 1988. Equity Fights AIDS and Broadway Cares were founded as separate AIDS-related fundraising organizations in 1988. 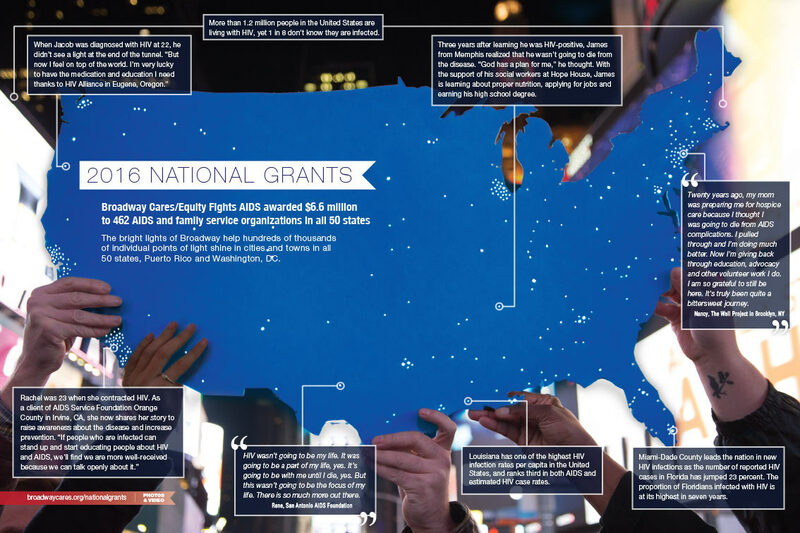 Since their merger in May of 1992, Broadway Cares/Equity Fights AIDS has had an unparalleled history of fundraising and grant-making in response to the AIDS epidemic. BC/EFA’s ability to keep pace with the epidemic by continuing to raise millions of dollars year after year is a testament to the ingenuity, resourcefulness and generosity of the American theatre community. More significantly, it is also a testament to the lasting impact the AIDS epidemic has had on the artists and professionals in the theater, dance and classical music industries. It is through their efforts that the majority of this fundraising is achieved. Funding support has been divided between support for The Actors Fund, the employee assistance program of the entertainment industry, and BC/EFA’s National Grants Program, which assists hundreds of community-based organizations that provide services for people with AIDS and their families at a grassroots community level nationwide. The ongoing funding support provided through the National Grants Program is an essential component of BC/EFA’s commitment, specifically to people with AIDS outside of the entertainment industry and the organizations that serve them. BC/EFA’s National Grants Program was conceptualized with two objectives. The first was to responsibly grant funds as quickly as possible so that organizations responding to the AIDS crisis would be able to address the constant state of emergency that people with AIDS faced during the early days of the epidemic. The second was to spread BC/EFA’s resources to as many organizations throughout the country as possible in order to create an awareness of HIV/AIDS among service providers and to use relatively modest grants made by BC/EFA to leverage greater resources to address the needs of all communities affected by HIV/AIDS. The HIV epidemic has grown and intensified beyond the gay community, particularly in communities of color, with a high incidence among women and their children, as well as in persons with substance abuse histories. HIV has always reinforced or created economic hardship. Therefore, BC/EFA saw a need to focus its National Grants Program on direct services such as food programs, support programs for clothing and personal hygiene items, and emergency assistance programs to avoid evictions or loss of health insurance. At the same time, BC/EFA was compelled to develop funding options that supported the integrity of families and the quality of life of people living with AIDS. Funding became available for family support, including bereavement support, burials for family members, summer camps, recreational and cultural outings and alternative therapies. BC/EFA also demonstrated its leadership by being among the first to fund needle exchange programs, long before most other funders supported these programs, and even before New York State decriminalized syringe possession. Initially BC/EFA’s National Grants Program committee met once a year to award grants to AIDS service organizations in six categories: Food Services; Emergency Assistance; Direct Services; One-Time Expense; Substance Abuse and Harm Reduction Services; and Quality of Life Programs. In March 2002, BC/EFA initiated a second grant round for a small subset of Nationally Recognized AIDS Service Organizations, as well as a number of organizations doing advocacy and public policy work that affects the hundreds of service providers BC/EFA funds. These are organizations whose mission as providers of HIV/AIDS services and/or advocacy is nationally recognized as pivotal within a large geographic area or an area with a particularly high concentration of those living with HIV/AIDS. BC/EFA serves as a grant making conduit between Broadway audiences (groups that immediately respond to the fundraising appeals made by entertainment professionals) and people living with HIV/AIDS. Consistent with this ideal, our grant making targets direct services. Nothing embodies this concept more than ensuring a person who is sick has a decent meal. In January of 2006, BC/EFA determined to make the Food Service Organizations category its own separate grant round affording the opportunity for a larger award than was available in the overall national grant round awarded every spring. We heard from both the entertainment community and our donors who said that while they are still deeply concerned about HIV/AIDS, they were also worried about the ability of people homebound with other life threatening diseases such as cancer, multiple sclerosis and chronic hepatitis to receive regularly delivered meals. In the last two years, a number of the largest meal delivery programs have tried expanding their services to include those with other debilitating illnesses. Because we believe that this expansion of services is a smart, strategic plan, beginning in January 2006, BC/EFA offered those food service and meal delivery programs with expanded missions the opportunity to receive larger grants of up to $35,000. This not only offers assistance to more people in need, but in doing so encourages increased funding opportunities in a very difficult fundraising climate, thereby ensuring that delivered meals will continue to be provided to people with AIDS for the foreseeable future. Broadway Cares was created in 1988 specifically to raise funds within the theatre community to be distributed through grants to AIDS service organizations in New York City and across the country. During the four years from 1988 through the merger of Broadway Cares with Equity Fights AIDS in May 1992, $1,067,000 was granted to 85 AIDS service organizations by a committee made up entirely of theatrical professionals. Following the 1992 merger and through 1996, this same committee granted an additional $4,740,000. 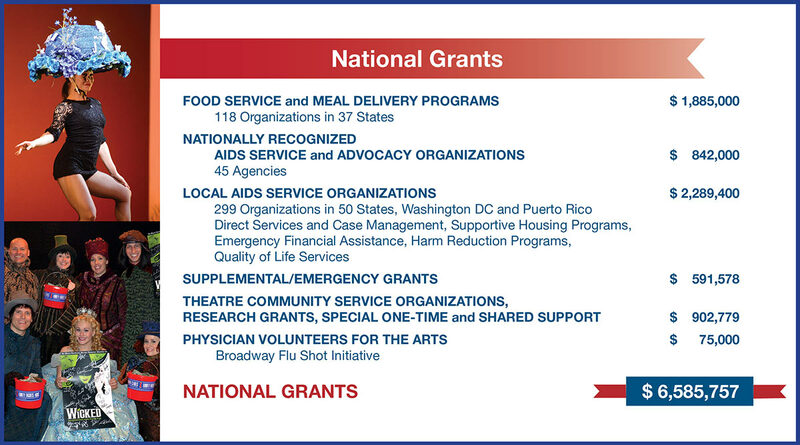 In 1996, the National Grants Committee was refigured to include both AIDS service providers and those in the theatre community active in raising funds for BC/EFA. Since its founding in 1988, BC/EFA has distributed more than $82 million through our National Grants Program. Please use the drop-down box below to view all the agencies BC/EFA funded in Fiscal Year 2016 by state.